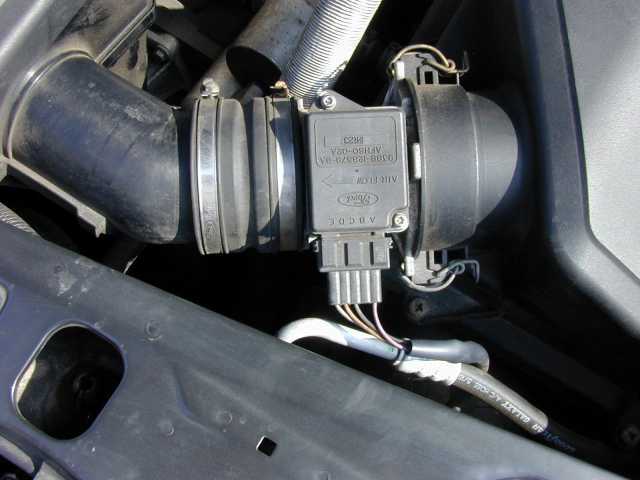 The MAF is a key engine sensor that detects the volume of air being drawn into the engine. 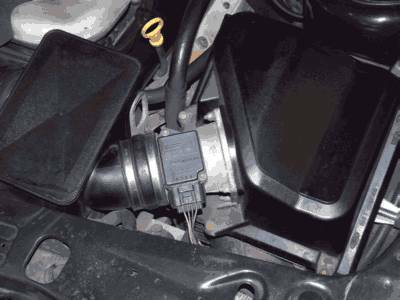 In older engines the pressure of the air in the inlet manifold was detected using a MAP (Manifold Air Pressure) sensor, however with the development of these new, highly accurate MAF sensors, the engine management system can take advantage of a more accurate knowledge of the load of the engine. In the case of the Scorpio, the EEC-V also uses this data to decide upon the operation of the automatic gearbox: several owners have reported gearchange problems and torque converter slip that we discovered was related to a dirty MAF and NOT a problem with the gearbox. Note that this does not cure the Cattlegrid effect which is a fault in the gearbox torque converter and nor does it cure problems associated with damaged wiring looms. The MAF sensor, tucked away neatly inside the air inlet trunking, is easy to forget. Indeed, unless it fails it will never normally be removed or cleaned. Much like the INJectors, it is not examined during a normal service. There is mounting evidence that a dirty MAF sensor can cause gearbox malfunctions, such as reported incorrect ratio errors, loss of 4th gear or torque converter clutch (TCC) operation, even on gearboxes recently overhauled at great expense. At first I suggested that the MAF should be replaced - but Martin S suggested cleaning the sensor wires instead, a simple operation taking ten minutes. After this, normal service was miraculously restored. But how can it get dirty? Surely there is an air filter to keep it clean? Well, yes there is, but air has to be allowed through, and with it microscopic pollen and other organic material which burns when it comes into contact with the sensor wire, which is maintained at 200 degrees C. The MAF electronics measures the amount of current required to keep the wire at this temperature, against the cooling effect of the inlet air flowing past it. Hence the current required is a measure of the actual airflow. As the MAF inevitably becomes coated in soot the readings for the Powertrain Control Module (PCM) become less and less accurate, but the PCM has no way of knowing this. It must accept the reading, and since the PCM uses the MAF to determine airflow for fueling, idle (with the IACV), the torque converter clutch and gear scheduling (see EECV) it is not surprising that the gearbox begins to produce errors. The PCM is selecting gears which are not actually suitable for the work which the engine is doing. 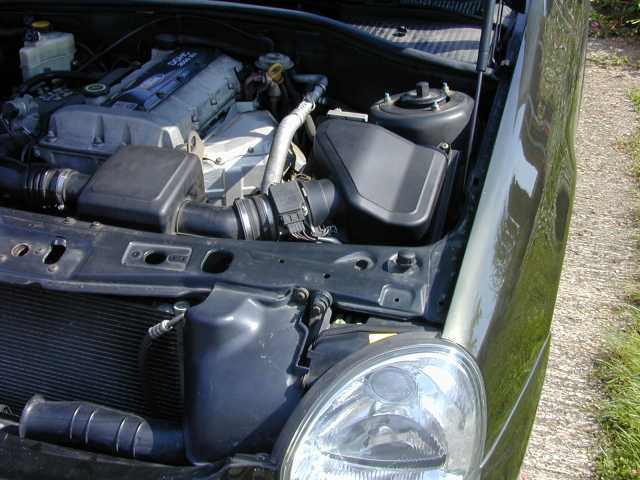 On the 24V it is best to remove the top of the air filter box and after loosening the hose on the other side, take the MAF complete with the cleaner box to the bench, where it is easier to remove the four 10mm bolts. 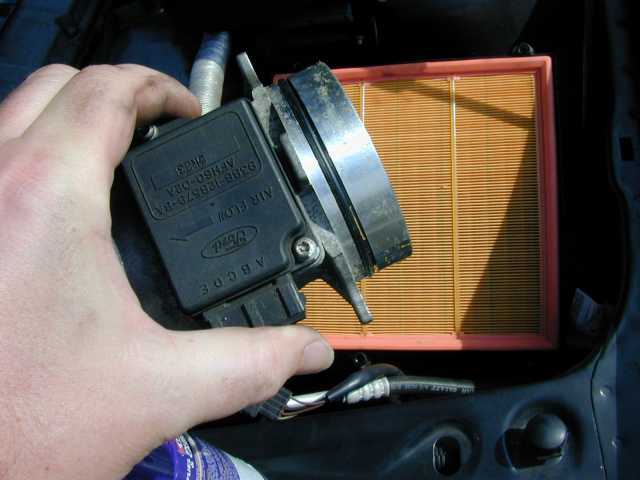 Remove the rubber O ring carefully and lay it to one side - it fits in the groove on the air filter box. Above. To my knowledge this is the first time this sensor has seen the light of day in 96,000 miles. The inside shows no sign of dust. The small circular housing contains the sensor wires and were covered in soot. Above, the internal wires of the sensor. One is the hot wire and the other a precision resistor. You can see how fragile they are - don't drop the sensor onto a concrete floor, or prod about in there with anything - if the wires break the MAF is junk and they are approximately £100 to replace so TAKE CARE. 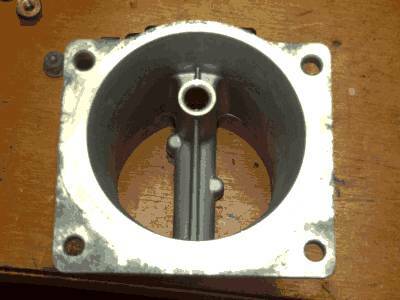 This is the inlet end of the sensor - the housing in which the wires sit is open at the other side, allowing air through. After a couple of squirts of carb cleaner, which very quickly evaporates, the sensor wires were bright and shiny again. I replaced the rubber O ring with a smear of light oil and then bolted up the MAF sensor to the air filter box. I then lubricated the rubber hose with another smear of oil and pushed the other end of the MAF sensor into the inlet pipe and re tightened the hose clip. Reconnecting the multiplug finished the job. Result? 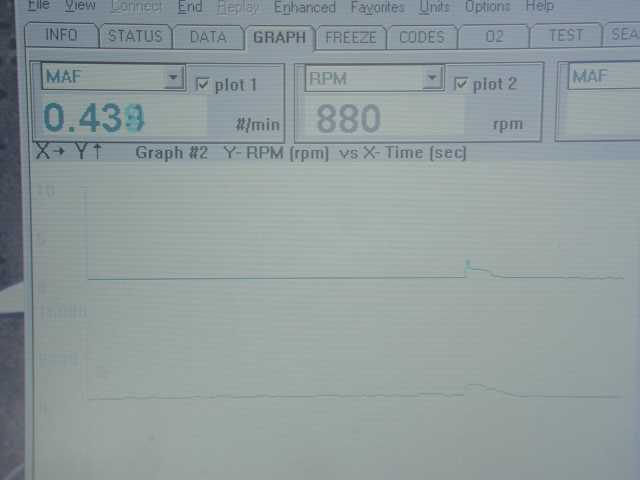 Smoother running on tickover, and smoother throttle response. Just in town the gearbox feels smoother, but a longer run is needed before I can tell the real difference. I did not experience any gearbox errors beforehand, but other owners, (Oliver and Pete) state that it produced a dramatic difference in their gearboxes. NOTE: take care that the sensor hoses are properly sealed against leaks. As a result of the discussions about MAF, one owner decided to try this himself. Here is his report. Here is the link to the .dat file for the OBD2 readings. Test starts, my MAF is reading 0.524 lbs/min airflow, the car is at 850 rpm and cold, the A/C is switched off. 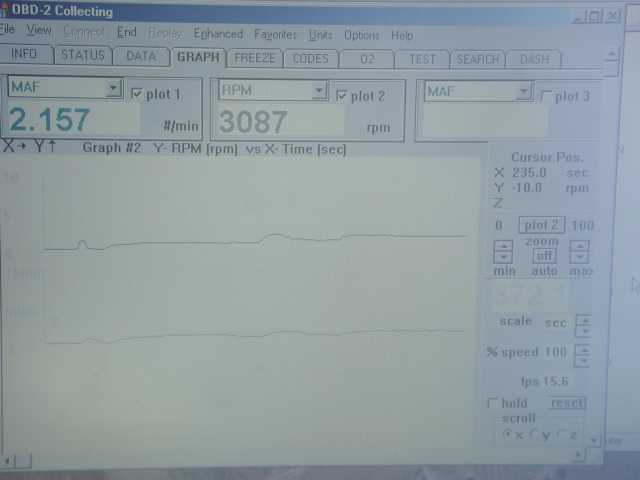 The flow rate gradually reduces, and as the engine warms up goes to 0.508 and down below 0.500, reaches 0.497. 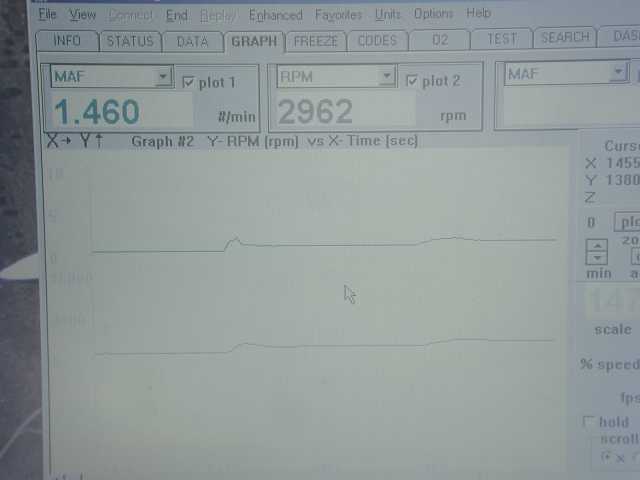 Now the engine has warmed up to normal and the MAF is reading 0.440 lb/min rate. Time to rev it up a bit. At 2397 rpm th MAF is reading 1.366 lb/min and returning the revs to idle, at 872 rpm the MAF is reading 0.413 which is about as low a reading as it has given so far. More revving, 3087 rpm gives 2.157 lb/min, back to 0.420 at tickover. This seems to be stable now at low 400 thousands of a pound per minute at tickover. Putting on the air conditioning, and the MAF reading rises to 0.575 at 850 rpm. 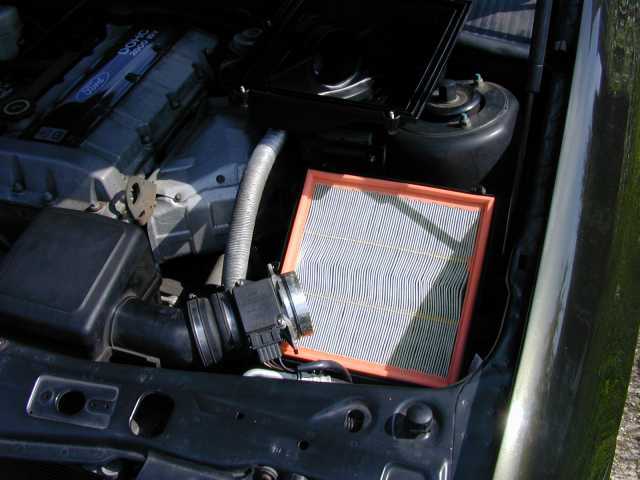 Don't know why the AC causes the reading to rise, unless it is to do with the cooling effect on the airbox which is near the AC valve. AC back off, 857 rpm and 0.407 lb/min. Airbox off first, five screws and a couple of clips hold it to the bottom of the airbox and the MAF itself, I took the opportunity to replace the air filter at the same time although the old one looked ok really, and I kept that as an emergency spare. This may have affected airflow in the sense that more air will pass through the new filter than through the old one. As will be seen, the opposite effect is observed, which should imply either the filter made no difference or the cleaning was even more significant. A jubilee clip holds the MAF to the next element in the airflow route, some sort of cube with big air hoses. 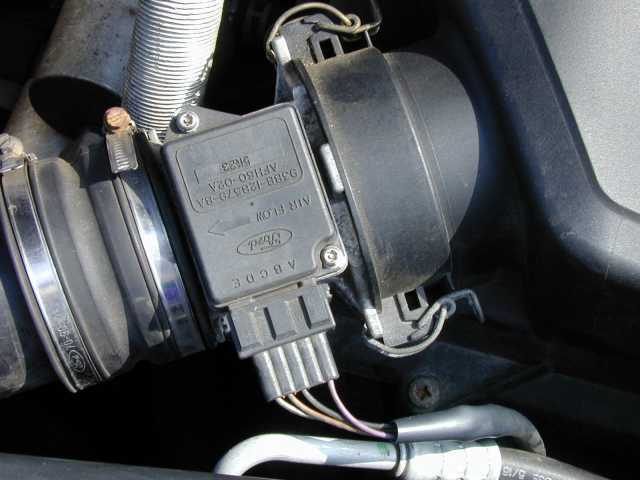 There is also the electrical connection to the MAF, which is the usual ford type with a retaining clip, press in the metal wire clip and the connection comes off easy as anything. The MAF is a short tube with a cross member, one end of which has a small tube containing the two wires which are the sensors giving the reading. When I get this off, the wires are a dull grey or brown, being quite hidden away the colour isn't obvious. Ok, so out with the "carb and injector cleaner" spray can, I fasten a little tube on the end of the nozzle, test it, and then spritz away liberally. Cleaner drips out of the other end of the sensor cross member, but the wires are miraculously undamaged. But not quite clean, now that the wires and chamber are mostly shiny silver, a few dregs of dark matter remain, so some more fizzing with the spray can until they are completely clean. Then a couple of squirts down the tube into the engine, clean up the MAF fittings and a drop of light oil to ensure a tight seal around the rubber ring and the whole thing goes back together the way it was to begin with. This isn't entirely trivial, the air boxes are flexible and move to the right as you have the air filter box off, so you have to shove it all back to the left before it fits properly, not too hard to do but worth expecting this. Also, don't forget to connect the electrics, this is probably the one that will be forgotten if anything is. Who knows what happens if the maf isn't wired up? Ok, fired up again, the OBD is reporting 0.418 at 860 rpm. This is unchanged, at first glance, but the engine has had the opportunity to cool off a bit. 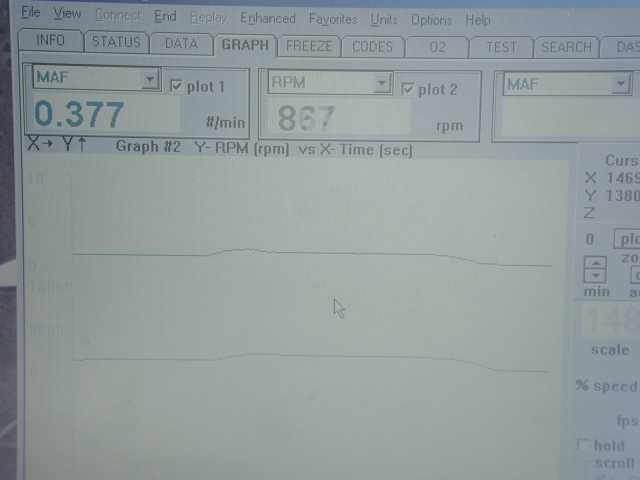 Returning to tickover, 867 rpm and the airflow is now 0.377, the lowest reading so far. Rev up and down, the setting is still on 0.377 at 868 rpm, a lot more consistent than before but that's probably just chance. Air conditioning on, and the reading goes to 0.554 at 861 rpm. Again, this is a bit lower than before. Running with revs and the AC on, the OBD shows 1.858 lb/min at a steady 3000 rpm, higher than with the AC off, lower than with the AC off and before the cleaning. Turning off the AC, at 2910 rpm the MAF is measuring 1.440 lb/min. Conclusion of all this is simple enough. The MAF contains two wires, one is very hot and any muck entering the unit will basically burn onto the wire and reduce its function. Basically, more heat must be pumped into the wire to keep it at the set temperature because it also has to heat up the dirt, this translates to the sensor imagining that more air is passing by the wire to make it that much cooler. And, since this unit is not cleaned by an automatic process or during routine servicing, it is inevitable that over the years the MAF will become gradually dirtier and this will cause it to read more air passing into the engine than is really happening, and the fancy automatic computer control metering the fuel and everything will be misled and will obviously pump more fuel into the engine than is actually needed. Conclusion, clean your MAF regularly because it will become inaccurate and it won't be cleaned by anyone else, and the effects of a major engine sensor giving readings that are up to 30% or more higher than they should can obviously be quite extreme, e.g. strange autobox selection profiles are just the tip of the iceberg, and heavy fuel consumption ought to be expected.